Somewhere in California, the deep crescendo of 3.8-liter, water-cooled, flat-six engines being wound to their redlines shoots from the tailpipes of a smattering of new 911 Carrera S sports cars and bounces off desert canyon walls. Update: 11/09/2011, 12:30 PM — Yesterday’s testing was staged out of Santa Maria, but we snuck north, pushing the limits of the time we were allowed with the car during the afternoon. Destination: a little, unused road in Central California that’s an awful lot like the roads near Cerda in Sicily — site of the Targa Florio. No time for pictures, just enough time to drive it. Within the last year, we’ve driven the GT3 RS, GT2 RS, Carrera GTS, Boxster Spyder, and 911 Speedster on this same road. Keep this information in mind as you read end-of-the-day impressions below. We learned a lot more there than we did on the recommended test route. Update: 11/08/2011, 7:15 PM — End-of-the-Day Impressions — Damping over rough-and-tumble pavement is fantastic…better than in the 997 Carrera GTS, a car which I remember mumbling something about perfect damping in a road test in the May 2011 issue (#191). The 991 processes sudden shifts in camber on the road surface better than any 997 can. The lengthened wheelbase and widened front track add stability, but the car is still playful, easy to place, and fast, fast, fast. The electric power-assisted steering is precise, accurate, and predictable. It’s not as good as early 911’s or 914’s non-assisted steering, perhaps, but this is not an early 911 or 914. Traction/grip is incredible on the S’s standard 20-inch wheel/tire package, yet approaching the limit is a predictable and gentle affair — you always feel like you know where the edge is. Transitional handling is very quick and Cayman-like — thanks to the longer wheelbase — yet with excellent traction when powering out of turns — thanks to the rear-heavy, 911 weight distribution. It has the best of both worlds. Did I mention sound earlier today? The note from the sport exhaust reverberating off rock walls in second gear is simply wonderful, and it rivals some of the best noises of recent Porsches this side of the Carrera GT. Though it’s guttural down low, musical in the midrange, and spine-tingling in the upper reaches, the sound may not be GT3-good, but it’s a big step up in excitement from the 997 Carrera S. But unlike a GT3, it has refined manners most people would be happy to live with on short or long drives. The seven-speed manual gearbox is very nice. The clutch is a hair grabby, but this one may have already lived a rough life this morning. It’s nothing that can’t quickly be adjusted to, though. Throws are light and precise, and seventh-gear lockout is interesting: You can’t shift from fourth gear to seventh in the 991 in the way you can shift from fourth to sixth in a 997. Seventh gear can only be accessed from fifth or sixth. All up, I still have to process today’s drive, but thus far all signs are pointing to the idea that the 991 is the step it needed to be, and then some. Dynamically, it’s at least the step the 996 made over the 993. Update: 11/08/2011, 3:00 PM — The New 911: First Drive On Track — The widening of the front track by 2.01 inches is noticeable in terms of reduced understeer. There’s a ton of initial grip on turn-in, followed by nice, neutral cornering behavior and, as always, great traction powering out of the turn. The Carrera S is confidence-inspiring at the limit in Sport Plus with PSM on. You are able to make considerable adjustments with the steering wheel and the throttle before PSM intervenes now, and it’s big fun to drive the car slightly sideways. If this is the basis for future 911s, the next Turbo, GT3, and GT2 promise to make a real leap forward. Update: 11/08/2011, 11:30 AM — The 400-hp, 3.8-liter engine is strong and it pulls beautifully with all the power you could need. There are no 3.4-liter Carreras here. PDK is a real step forward with quicker shift times and sharper response. Ride is superb, yet handling remains sharp; it’s never floaty and always confidence inspiring. 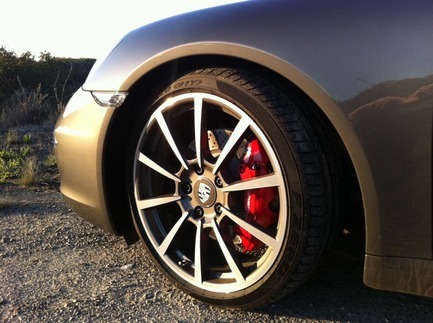 Sport setting for the dampers makes a noticeable difference, but it is more usable on real roads. Sport exhaust is fabulous. The 9A1 engine sounds much better than in the 997-2. It burbles on the overrun like an early 911 with carburetors or MFI. From the passenger’s seat, the interior feels Panamera-like, but from the driver’s seat, it feels surprisingly like a 911’s – think 997 with a different center console. The driving position is excellent. The new, pop-up sunroof fixes the 29-31 mph wind buffeting/whumping found in 996s and 997s, but this annoyance may have moved to when you’re running with one window down. The car looks great on the road and in various colors. It looks special and expensive, and it has a great stance. Porsche Cars North America expects 30 percent of its U.S. sales in 2012 to be the 911.